Suzy Storck is not an easy read. It goes all the way to pure naturalism and suddenly shifts to complete poetry. It confuses you and contradicts itself, swirling from one time and space unit to another, putting them sometimes in parallel. It’s a tragedy and a farce—a Greek drama and a sordid tabloid story. It deals with a very complex (or simple?) taboo and does it with softness and violence, not giving the audience a clue as to how to handle it. Design wise, you need to be able to respond to that complexity, creating an atmosphere where both the extra poetic and the extra real can cohabit. You need to let things rest up in the air, without creating a context which would give easy answers to the audience. When it comes to the costume, as characters keep contradicting themselves, you have to allow that to happen, you have to give them enough grounding so we can connect to them, but enough complexity so that we can’t put labels on them. With Jean-Pierre, we looked at ideal images of the Woman and her Child, the symbole of tenderness, love and stability. Then we confronted them to real images of family getting overwhelmed by their kids. We looked at how the presence of children can instantly flood a room and shift it 90 degrees. We looked at feminist art, and how society sees women who refuses to have a child. We got inspired by surreal films, old and news, set in subtle spaces in-between reality and dreams. 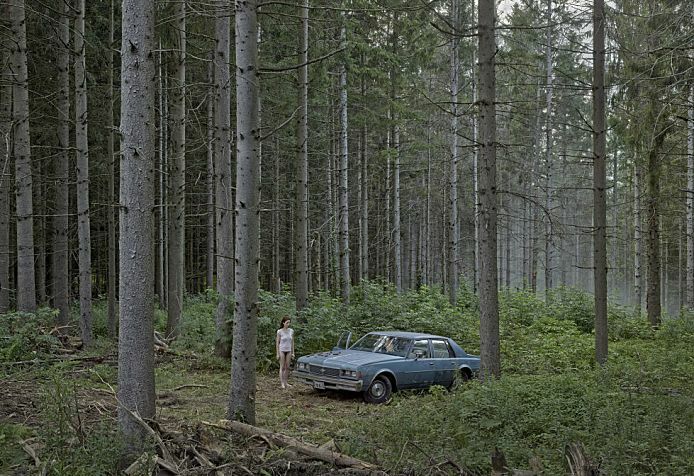 We got obsessed by Gregory Crewdson’s photographs. The design aims to invite people into the uncanny world of Suzy Stork. We host them into the hopes and disillusion of her mind, and how one day she suddenly couldn’t take it anymore. It’s about witnessing, together, that shift: when the life of an ordinary person flips for ever. The mystery of her action is disturbingly familiar, and I hope that the design will let you enter that confusing place and leave you unsettled—with no need to condemn nor to forgive. Array (  => Array ( [id] => 189 [created] => 1507540860 [updated] => 1507540860 [ordering_count] => 180 [intro] => Cécile Trémolières on designing Suzy Storck [title] => The uncanny world of Suzy Stork: Cécile Trémolières [slug] => the-uncanny-world-of-suzy-stork-cecile-tremolieres [category_id] => 0 [body] => Suzy Storck is not an easy read. It goes all the way to pure naturalism and suddenly shifts to complete poetry. It confuses you and contradicts itself, swirling from one time and space unit to another, putting them sometimes in parallel. It’s a tragedy and a farce—a Greek drama and a sordid tabloid story. It deals with a very complex (or simple?) taboo and does it with softness and violence, not giving the audience a clue as to how to handle it.